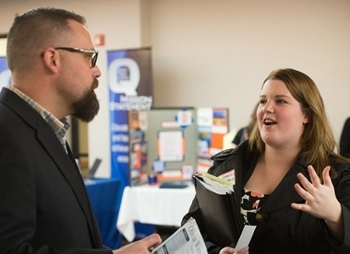 Multiple Southern Illinois University Edwardsville alumni were among the representatives from more than 220 major companies seeking prospective employees during the Career Development Center’s spring career fairs held Tuesday, Feb. 28-Thursday, March 2. 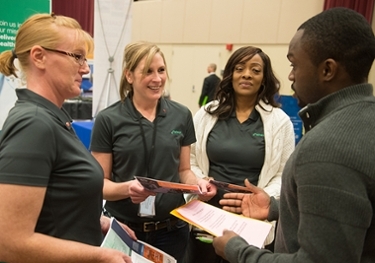 The career fairs featured employers interested in utilizing the knowledge and skillsets of SIUE students pursuing degrees in the College of Arts and Sciences, and the Schools of Business, Engineering, and Education, Health and Human Behavior. Employers emphasized their pursuit of prospective employees who can demonstrate strong soft and technical skills, both of which they have a history of finding in SIUE students. Carpunky also secured her first position with Patheon during an SIUE career fair and has grown tremendously through the company since. “We’re seeking students with a background in science, along with those who have gained applicable experience through the School’s strong engineering programs,” she added. Students in attendance emphasized their preparation for the career fairs through the support of the Career Development Center and academic program faculty. “I’m looking for paid internship positions and talking with employers about the focus of their company to make connections, see the potential for upward mobility and am sharing my resume with them,” said Plainfield native Isaac Jensen, a senior studying marketing in the School of Business. For more information on future career fairs and additional services offered by the SIUE CDC, visit siue.edu/careerdevelopmentcenter/, on Facebook or Twitter. Photo: Representatives from Patheon, including two SIUE alumni, speak with a current student during the spring career fair. SIUE student Oliva Wernecke, a native of Decatur, speaks with prospective employer Matt Andrews, principal of Dennis Lab School in Decatur.